The 1995 World Cup Final was, to most people around the world, little more than a thrilling rugby match. But to the people of South Africa, it was a turning point in their history—a shared experience that helped to heal the wounds of the past even as it gave new hope for the future. The architect of this benchmark event was the nation’s president, Nelson Mandela. Its builders were the members of South Africa’s rugby team, the Springboks, led by their captain, Francois Pienaar. As “Invictus” opens, Nelson Mandela—a man who had spent 27 years in prison for fighting against apartheid—is elected president of a South Africa that is still bitterly divided. Though the unjust system has officially ended, the long-held racial lines between people cannot easily be erased. 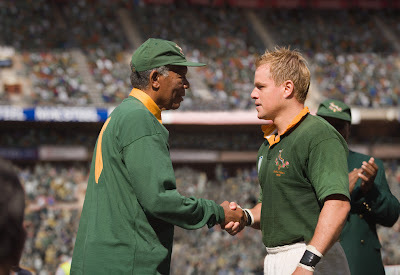 With his country teetering on the brink of implosion, President Mandela sees hope in an unlikely place: the rugby field. With South Africa poised to host the World Cup Finals, Mandela looks to unite the country behind their national team, the Springboks. Opening soon across the Philippines, “Invictus” is distributed by Warner Bros. Pictures, a Warner Bros. Entertainment Company.